Just spin the roller to bring this dinosaur to life with silly sounds, fun music and 2 levels of ball-jumping action. The excitement gets a-rollin' and a-poppin' when baby drops the balls through the dino's back, tail or belly. Fun ball poppin' action for your little one as the balls bounce up, down and all around, making fun sounds & tunes as they go. But where they'll pop up, nobody knows! Your little wiggle worm will love crawling & chasing after the balls that pop out of the mouth, tail or belly – and doing it over & over (& over) again! Bat-at roller activates 2 levels of ball poppin' action, silly sounds & tunes. Dropping the balls up top or down below makes the action happen, too! 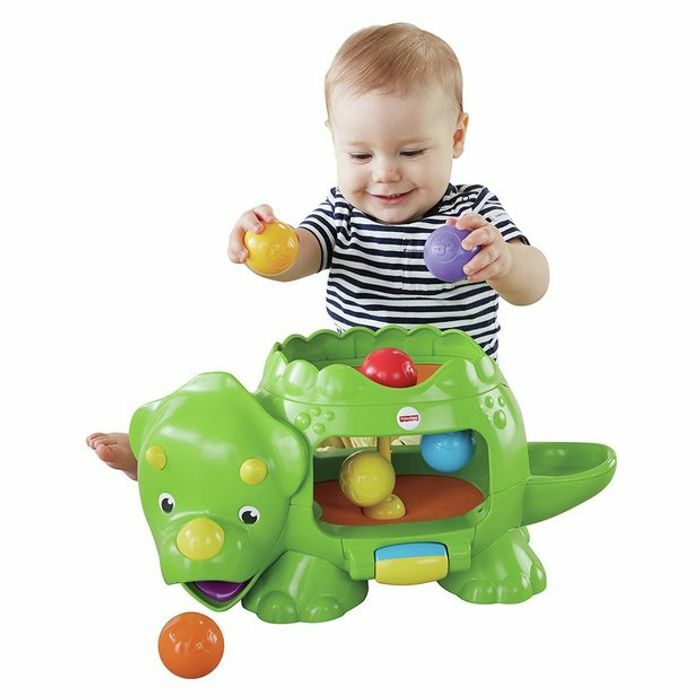 Grasping and dropping balls into the dino for put-and-take play help promote baby's fine motor skills and eye-hand coordination. And when balls pop out of the dino, baby can crawl after them, giving gross motor skills a healthy workout, too! Includes double poppin' dino and 6 colourful balls. Batteries required: 3 x C (not included) plus .